You must make reservations at least 5 minutes in advance of the time at 1776 Steakhouse. Whether you are celebrating a special occasion or just want to enjoy a perfect meal out, we invite you to experience 1776 Steakhouse. It's the ideal setting for great food and great conversation. Voted best steaks and most romantic restaurant at the beach. Raw oysters served on the half shell with wasabi cocktail. Lobster filled black ravioli topped with diced shrimp & crabmeat, finished with a cream sherry sauce with basil and chopped tomatoes. Wrapped in a puff pastry, served with fresh fruit & plated on a raspberry champagne reduction. Chilled jumbo shrimp served with wasabi cocktail. Large mussels & andouille sausage sautéed in garlic herb butter. Casino style: casino butter, apple smoked bacon & provolone. Finished in an asian butter. A 1776 favorite. Sautéed clams served drunken style with fresh basil, lemon, garlic, old bay & fresh ground pepper, finished in white wine. Day boat scallops, sliced thin, breaded in panko and fried, served with a horseradish cream sauce. Enjoy our chef's special daily creation. Gorgonzola dressing, crumbled bacon, cucumber & cherry tomatoes top this crisp iceberg wedge. Fresh cut romaine tossed with our house made dressing and topped with freshly shaved parmesan cheese, with or without anchovies. Tomatoes, basil and mangos drizzled with olive oil and a balsamic glaze. Apple smoked bacon, dried cherries, walnuts & crumbled gorgonzola cheese gently tossed in maple vinaigrette. Iceberg lettuce, hard boiled eggs, tomatoes, smoked andouille sausage & provolone tossed in a zesty greek dressing, garnished with a pepperoncini pepper. 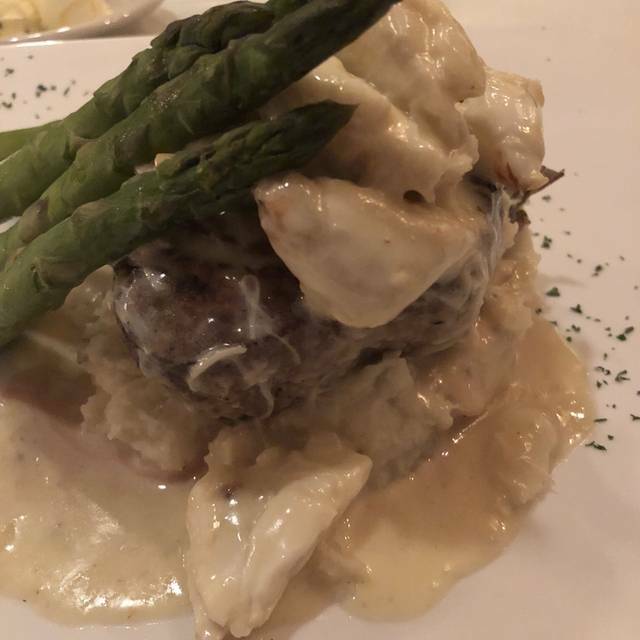 Three 3oz filets topped with cream reduction with crab, bleu cheese & demi, and caramel brandy mushroom sauce. Uniquely ours. A tender and juicy cut of beef. Well marbled for peak flavor. 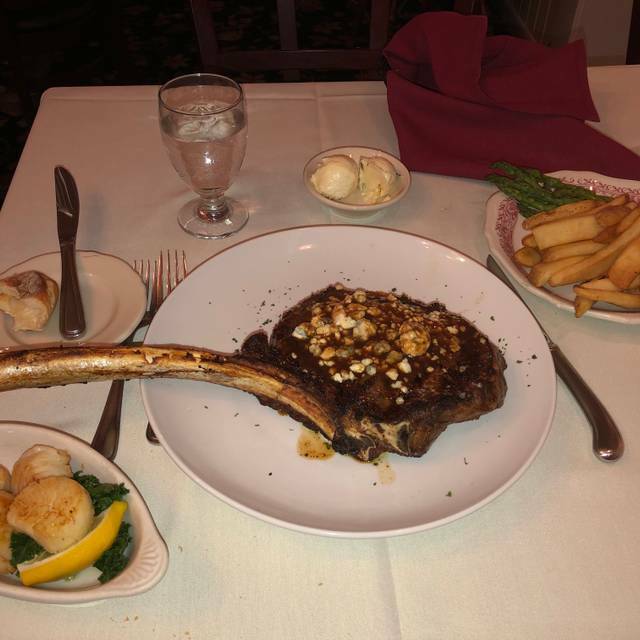 A large bone in version of our tasty cab delmonico. Always a favorite. Dry aged to ensure more flavorful and firm body. Slow roasted prime rib served with our house made au jus. The best around! Usda prime. Combines rich flavors of a strip steak & the tenderness of a filet. A domestic classic. Rosemary mint demi glaze. All lump, no fillers, served with mashers & garnished with cranberry relish and vegetable of the evening. Pan seared with provencal herb, lemon, garlic, and shallots, finished with white wine and cream, served on mashers with vegetable of the day. Wild salmon filet roasted on a cedar plank and finished with a grilled cucumber & roasted red pepper sauce, served with wild rice & asparagus. Lobster filled black ravioli topped with diced shrimp & crabmeat, a cream sherry sauce with fresh basil and chopped tomatoes. A unique house specialty. Petite filet & your choice of lobster tail, jumbo lump crab cake or stuffed lobster tail. Served with baked potato and chef's vegetable. Broiled with lemon and butter or topped with crab imperial and finished with chesapeake sauce. Served with mashers and chef's vegetable. Pan seared day boat scallops finished in a fresh tomato, herb and white wine butter sauce. Served on mashers and asparagus. Large ravioli stuffed with grilled vegetables and topped with an herbed- gorgonzola cream sauce. A fresh tomato-basil cream sauce flamed with vodka and served over penne pasta, topped with freshly shaved parmesan cheese. Fresh catch served with chef's choice of starch and vegetable. The food and service are great. This is the best place in the Rehoboth/Lewes area to get a steak. The prime rib was fantastic! Our friend had the filet mignon triple and raved about that also. Food is great! Service is great! Will be going back. The prime rib is usually cooked to perfection but during out last visit my medium rare was a definite medium and my husband's was overcooked also. Perhaps just an off evening. Everything was great. Service was exceptional, food was absolutely delicious, everything was perfect. 1776 made our anniversary special. Can’t wait to go back. I am a huge fan of 1776. But this time the steak (Delmonico) was just not up to 1776 standards. It was smaller/thinner than the past, not as juicy and overcooked (medium instead of med/rare). Good but not 1776 great. I surely will be back but I hope the cuts and the cooking get back to normal. Everything else was excellent! 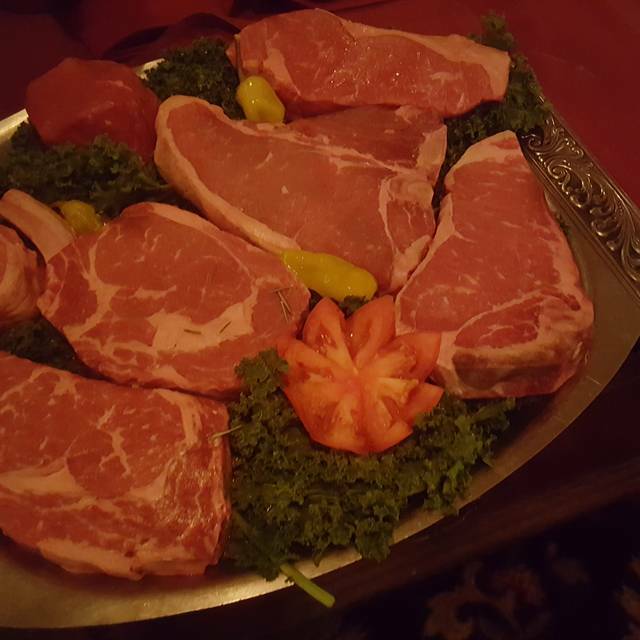 We were in the area for the weekend and this was our 1st time at this steakhouse, so we had no idea what to expect. But to our delight everything was wonderful! We were well taken care of by Alex the waiter. We were also checked on by the maitre d' and thanked for our business. He also thanked us again as we were leaving. I also told him that we would surely be back. As a matter of fact we will be back in the area in a couple of weeks and have already made the reservations. We've also made reservations for Mothers Day. Always a great meal, but make no mistake, it’s expensive. Service is top notch and very attentive. 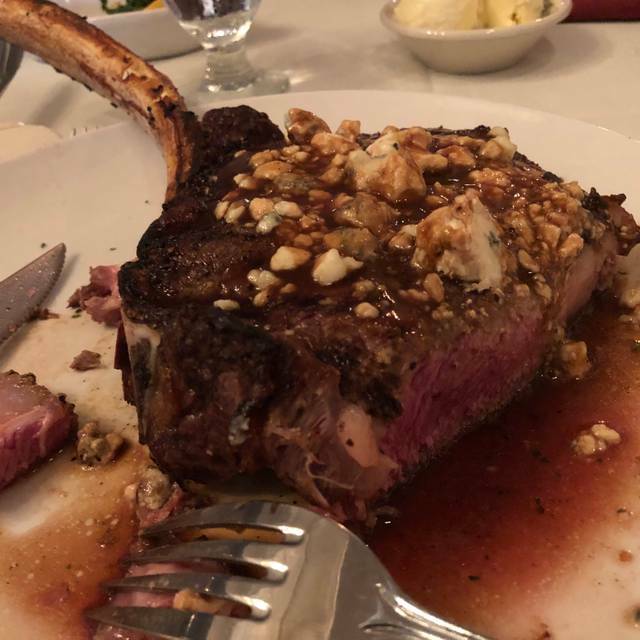 It’s an iconic steakhouse the really doesn’t belong in a strip mall, next to a movie theatre. A good choice for special occasions. The food was good but the atmosphere not so good. We mad a reservation for two and they tried to sit us at a table for four when it wasn’t crowded. You would expect to get a better table when you reserve. Price is high for what you get. The food is consistently excellent. The service is always top notch. One of our favorite places to dine. As always outstanding. Robert, our server, dead fantastic. First time ever for Rehobeth Bay oysters, very good. 1776 is our go to for steak and celebrating special events with the family. The service is always excellent! As always, we had a great time. Will return again. THANKS! Great service, food, attention to detail, value and atmosphere. Always make you feel special. 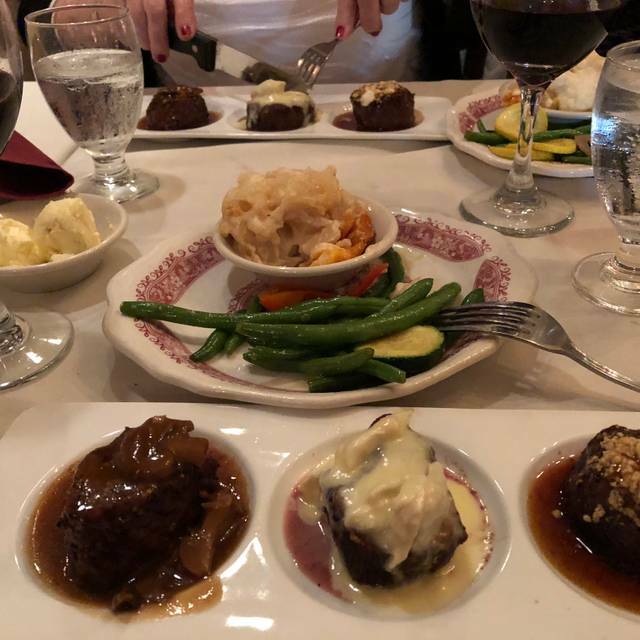 My companion had their signature steak and loved it. I had cedar planned salmon, which was good, but not as good as their steaks. Overall, an excellent dining experience. It was our first visit there and we will return. The staff was excellent. Presentation and explanation of the steaks was phenomenal. The food melted in our mouth. EXCELLENT! As usual, terrific if you like beef and its accoutrements. Great waiter, ambience. All around good. First time frequenting this restaurant. Pleasantly surprised. Service was great and food/wine all very enjoyable. Decided to try 1776 for lunch. Worst dining experience we have had in a while. I’ve been to dinner many times and always enjoyed 1776. Lunch was a different story. There were three tables occupied one waiter, we were all at different stages of lunch so not a lot of overlap. Service was terrible. Took forever for soup to arrive and then even longer for sandwiches. Lunch took just bout 2 1/2 hours. The soup came out tepid Ike it was sitting room temperature for a while, the soup was a crab lobster bisque lacking flavor and appropriate temps. Such a terrible experience it turned me off for wanting to go there for dinner again any time soon. Skip 1776 for lunch. The food was excellent and a good value. The hostess gave us the “stink eye” presumably because we were too casually dressed. Otherwise it was a good meal. We’d definitely go back. Fabuleuse donner with impeccable service. No rushing. Did not like the singer perhaps that could be set up in the bar area. Great wine list. Great food, service, and ambiance. The food is a little pricey, but they have a light fare with more reasonable prices. It is all a matter of what your willing to pay for. We go but not very often as it is expensive. We would go more if it were a little less. They also have entertainment, which is very enjoyable. We had reservations 2 weeks in advance to celebrate my wifes 2year anniversery of her kidney transplant . We were seated in the bar area in a high traffic area and it was so load we could not talk to each other without raising our voices. I was worried someone was going to spill a drink on me because they kept bumping into me as they passed me. The food was not as advertized we have had better food at cheaper resturants. The dining room was quiet with a piano playing nice music but we could not hear it for the noise in the bar. We will not be back!!!!!!!!!!! Great seating. Food was wonderful. Server was attentive Our new go-to restaurant for any and all occasions. Great food and service! We loved our meal, charming decor, like going back in time. Excellent dinner and impeccable service by Alex! Food & service were outstanding. 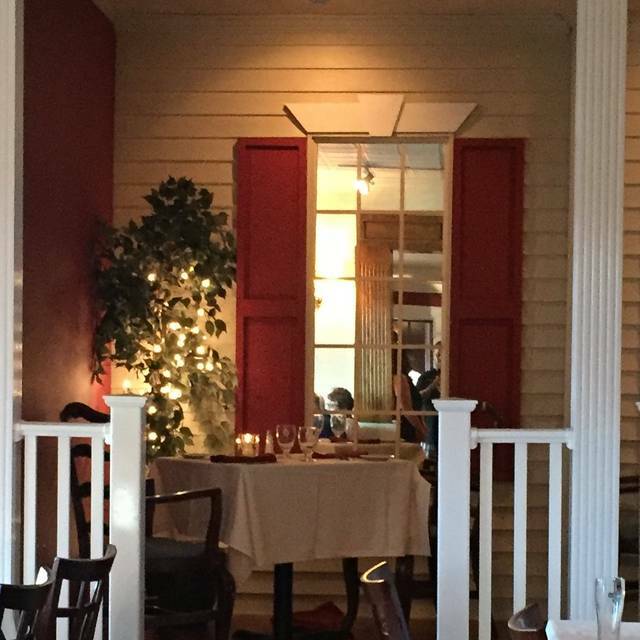 It was my granddaughter's first experience at an upscale restaurant and she was in awe. Only allowing customers with reservations made the dining experience much more pleasurable--no one was standing over your table while you were eating. Fine dining as I always like it. Quit, nice wine list. Can choose beef or sea food. Soup is wonderful. Great place to go for a relaxing end of the week night out. This was a pleasant surprise.... the food was very good and the service was excellent ! I can not wait to go back again !! We absolutely love 1776! It used to be our special night place, but now we go there just because. We always enjoy our visits to 1776 because of the presentation and service that comes with the excellent food. Our waitress was excellent along with the food. 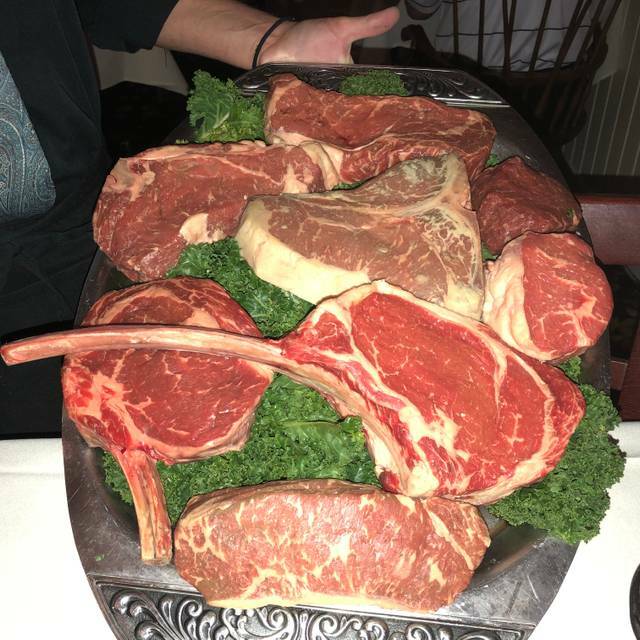 My only disappointment was that I ordered the end cut of prime rib. I have ordered it before from other restaurants and it has always been tender. The meat I had was extremely flavorable, but tough. The rest of the food was excellent and we enjoyed it very much. Cannot wait to come back when I’m back in town.